If you follow me on Twitter or Instagram then you may have seen that a few months ago I was working on an exciting little illustration for a good friend of mine. 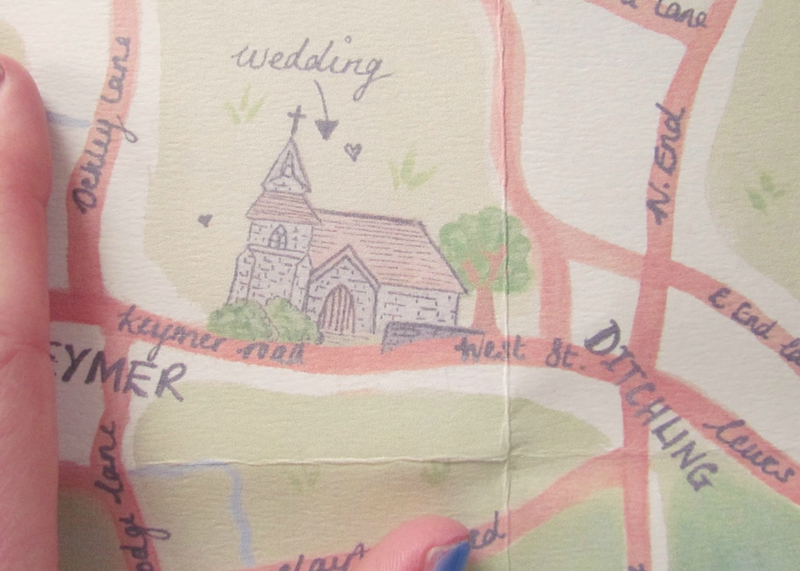 With her wedding fast approaching, she asked to borrow my creative skills and draw a map to send out with the wedding invites. Just a few days ago, I received my invite in the post. Not only is the invite just gorgeous, the final map looks great and I really enjoyed creating it so I thought I would share some pictures of the process and final piece with you. Initially, I created some quick doodles of a map print out with a green pen I just happened to have to hand. Once I was happy with the layout and I had a good idea of what I wanted to do, I sketched out my design on cartridge paper and painted it using both watercolours and acrylic paint. I wanted the place names to stand out and so I used a black fine liner to write these. When I was finally finished, I sent the final image to my lovely chum who then had it printed onto off-white textured paper which gives it a lovely rustic touch. I was so impressed with the invites in general. I love the rustic feel and simplicity of them which creates an elegance that just perfectly mirrors that of the soon-to-be bride. I particularly liked the brown envelope and twine alongside the touches of blue from the cornflowers. This will tie in beautifully with the wedding, which will see the bride holding cornflowers and the bridesmaids wearing cornflower blue dresses. I really enjoyed creating this and it was such a pleasure to be able to contribute to her wedding in this small way. I'm so looking forward to spending her special day with her and to the 'wedding season' in general. It really seems to be the year to get married amongst my friends! Let me know what you think in the comments below & please share if you enjoyed reading this!